Keto Breakfast Hash with Chorizo and Eggs looks like a standard hash, but is chock full of nutritious vegetables as well as flavor. Most of us probably have a few recipes or foods that we miss from the days before we went keto. Maybe it’s chocolate chip cookies, macaroni and cheese, or pizza (fathead to the rescue!). Or maybe it’s breakfast foods like pancakes, waffles, or potato hash. We have good news; our hash is loaded with veggies and low in carbs. Celery and zucchini stand in for starchy potato, and soak up the flavor of olive oil, chorizo, and garlic. Fried egg on top (runny yolks for us, please!) and a bit of Parmesan cheese make it completely irresistible. This is the type of meal we could happily eat for breakfast, lunch, and/or dinner. What recipes do you crave most since going keto? We’d love to come up with keto versions! 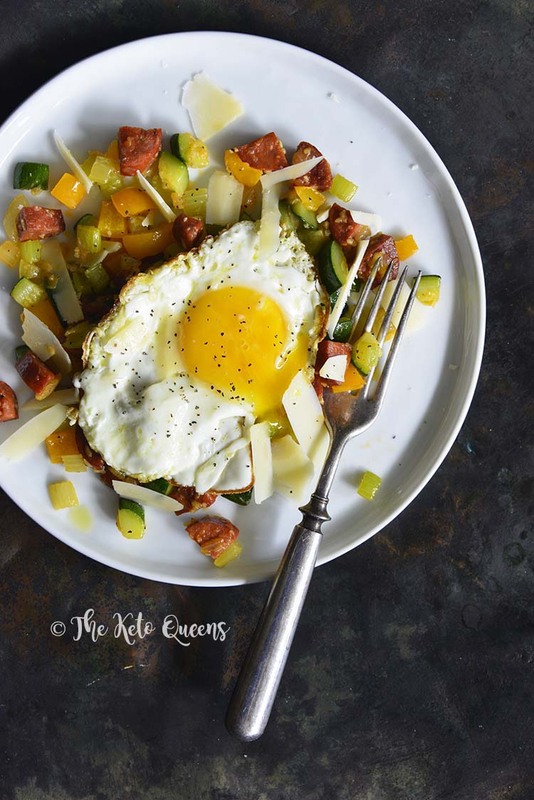 Keto Chorizo Vegetable Hash with Fried Egg looks like a standard hash, but is chock full of nutritious vegetables as well as flavor. Heat the oil in a medium skillet over medium heat. Once hot, add the chorizo and cook until browned, about 3 minutes, stirring occasionally. Add the celery, zucchini, bell pepper, and onion; turn the heat up to medium-high and cook until the veggies are softened, but not mushy, about 5 minutes, stirring frequently. Add the garlic, turn the heat down to medium, and cook 1 minute, stirring constantly. To serve, divide the hash between 2 plates. Top each with a fried egg and half of the cheese.